Italy is home some of the most romantic cities in the world, full of history, charm and friendly people. Whether your ideal romantic trip means tasting new foods, visiting museums or relaxing on the coast with a view of the sea, there are many fantastic destinations to choose from. Spend a night in Venice, visit the ancient ruins in Rome, or splurge on a romantic suite on Capri. Here are the best places to visit in Italy. 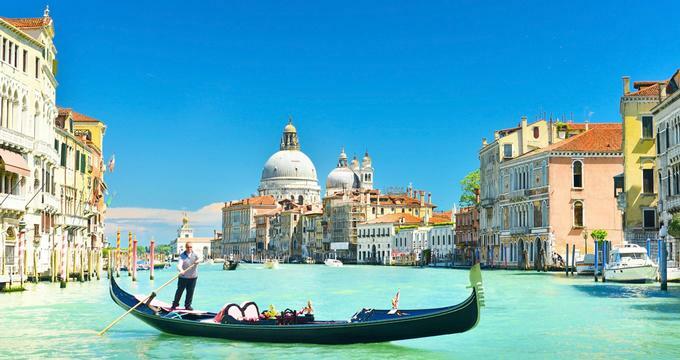 Take a gondola ride back in time in the stunning and historic floating city of Venice, Italy. Discover the Doge’s 9th century residence, a colossal Gothic palace that was the center of the Venetian government for practically seven centuries. For art buffs, the Gallerie dell’Accademia is sure to satisfy as it houses fabulous Venetian art from the 14th to 18th century. Among the pieces in the permanent collection are the works of Tintoretto, Canaletto, Belinni, and Titian. Admire the personal collection of one of the 20th century’s greatest collectors, Peggy Guggenheim. The collection is housed in her former home by the canal and includes the works of nearly 200 artists like Jackson Pollock and Picasso. Dating back to the 9th century, the Basilica di San Marco boasts 8,500 square meters of fantastic mosaics and gorgeous Byzantine domes. Meanwhile, tourists can see the marvelous architecture and hear about the mystical properties of the Basilica di Santa Maria della Salute, a 17th century domed church situated at the entrance of the Grand Canal. Lovers of architectural wonders are sure to enjoy the awe inspiring Gothic Italian-brick church, the I Frari. Make sure to see its many stunning assets such as the Madonna with Child by Bellini. 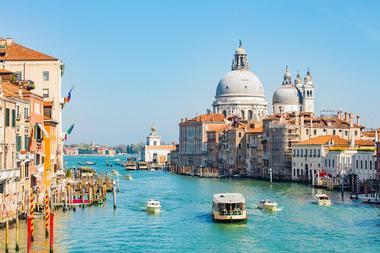 Read more: Honeymoon Vacation Ideas in Venice. 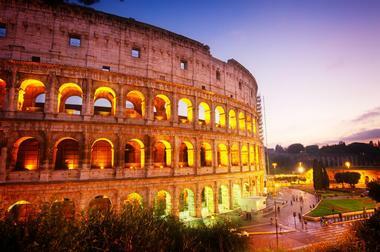 Venture into the historically and culturally rich city of Rome for an exciting vacation in Italy. One of the world’s greatest art collections can be found in this great city via the Vatican Museums. Stroll along a total of 7 kilometers of halls with various works of art, where one of the features is the work of Michelangelo at the Sistine Chapel. The Capitoline Museum, first founded in 1471, is the oldest public museum in the world and will blow your mind with a permanent collection of crowd-pleasers like the famous Lupa capitolina. Explore a true treasure trove at the Muzeum Nazaionale Romano Palazzo Massimo alle Terme, which is home to gorgeous collections of classical art like a Greek piece in bronze from the second century BC. Step into the birthplace of the Renaissance, the city of Florence, and experience the best of one of the world’s most influential art movements. The city is certainly one of the most popular cities in Italy to visit amongst art buffs and budding aficionados. See magnificent liturgical treasures like Ghiberti’s Porta del Paradiso or Michelangelo’s La Pieta at the impressive Grand Museo del Duomo. More of Michelangelo’s works and those of Donatello as well can be admired and viewed at the Museo Del Bargello. This museum is also notable for safeguarding the most comprehensive collection of Tuscan Renaissance sculptures in the country. At the Museo di San Marco, on the other hand, tourists can explore one of the city’s most spiritually uplifting collection of works and devotional frescoes. Step into the massive Renaissance palace of Palazzo Pitti, which was built in 1457, and enjoy the magnificent construction of the building. There is also a silver museum housed within its walls that is very much worth a visit. 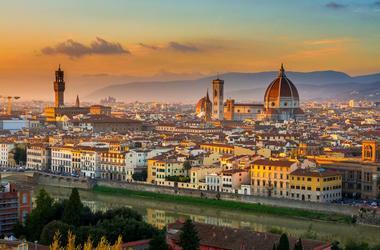 One simply cannot explore Florence and miss out on its most iconic landmark, the Duomo. Take in its beautiful facade of white, pink, and green marble and stand in wonder at the frescoes and glorious stained glass windows. Read more: Best Romantic Vacation Ideas in Florence, Italy. It’s not often that a city’s claim to fame is that of an architectural project gone wrong, but this is certainly the case for Pisa. Thus, it only makes sense to start your vacation to the city with its most well-known and much beloved attraction, the Leaning Tower. The tower is 56 meters tall and took an incredible 200 years to build. Its signature tilt was caused by a weak foundation of subsoil. Piazza dei Miracoli, on the other hand, is practically flawless. As one of the most immaculate urban spaces in the world, the piazza is home to a cathedral and dozens of vendors. To see beautiful tombs of prominent Pisans, head to the Camposanto. Despite the destruction caused to the site during World War II, a handful of frescoes were thankfully salvaged. Don’t underestimate the museums of Pisa, though. They’ve got a handful of amazing museums to see and explore. Start with the Museo Nazionale di San Matteo, which is home to 12th to 14th century paintings including those by Lippo Memmi, Gentile da Farbiano, and Taddeo Gaddi. To see religious artworks that were previously displayed in baptisteries and cathedrals, head to the Museo dell’Opera del Duomo. Ironically, the most beautiful part of the museum is outside at its cloister garden, which even has a free view of the Leaning Tower. Feel the pull of the ocean and enjoy an absolutely relaxing vacation at the idyllic locale of Capri, Italy. Make your way to the ancient complex of Villa Jovis, which was the main residence of Tiberius in Capri. The ruins are a joy to explore, and the right guide will make the historical journey an unforgettable one. If you’re interested in heading to the peak of Capri, take the exciting chairlift ride of the Seggiovia del Monte Solaro. 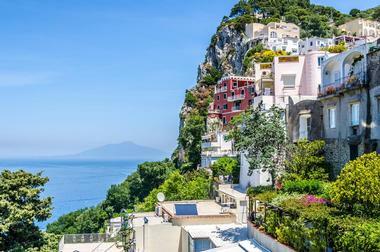 The ten-minute ride also offers incredible views of Capri’s majestic scenery, and on a clear day, you can even catch a peek of the entire Bay of Naples. A trip to Capri isn’t complete without a visit to its most famous attraction, the Grotta Azzurra, a gorgeous sea cave that contains a jaw dropping blue light that gives the cave an other-worldly feel. A religious monastery in Capri, the Certosa di San Giacomo is largely regarded as one of the most beautiful examples of Caprese architecture still remaining today. The monastery, which is now home to a school, gallery space, and museum, also features amazing 17th century paintings. Spot a bit of Morocco in the Capri at the Casa Rossa, the former home of an American colonel named John Clay MacKown back in 1876. Jet to the bustling metropolis of Milan to see a city that is not just historically and culturally rich, but also a hub for some of the best fashion and design that Italy has to offer. Feast your eyes on the most famous mural ever painted by the great Leonardo da Vinci – The Last Supper. Tucked away somewhere in the refectory attached to the Basilica di Santa maria delle Grazie, the mural depicting Jesus Christ and disciples has evoked powerful emotions in viewers from all over the globe. 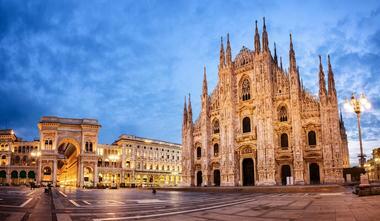 Another gorgeous site to see in Milan is the Duomo, an extravagant Gothic cathedral that took 600 years to complete. The interior and exterior are both equally impressive. To get a taste of Milan’s artistic offerings, head to the Museo del Novecento where a great variety of artwork is pristinely displayed. Some of the museum’s featured artists include Carlo Carra and Boccioni. Lovers of science and technology on the other hand will go gaga over the impressive collection of Milan’s Museum of Science and Technology. It’s a fitting museum to be housed in Milan considering it is the city where Leonardo da Vinci invented some of his finest work and designed some of the most unexpected contraptions imaginable. 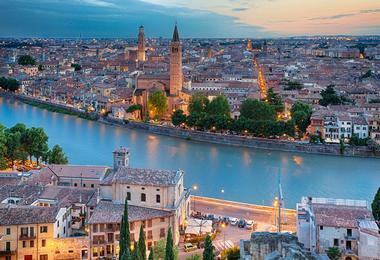 It’s no coincidence that Shakespeare’s Romeo and Juliet was set in the fair city of Verona. With the city’s long history of romance, drama, and dangerous family feuds, the play’s location was fitting indeed. Start your vacation with a visit to the Galleria d’Arte Moderna Achille Forti where a stunning collection of artwork from between 1840 and 1940 is showcased. Nature lovers, on the other hand, will love a trip to the Giardino Giusti, a magnificent garden filled with fabulously maintained plants and some stunning sculptures. If tours around grand churches are what you’re looking for, the Basilica di Sant’Anastasia certainly won’t disappoint. Built sometime between the 13th and 15th centuries, the Gothic cathedral is the largest church in Verona with its own collection of art for visitors to admire. Admire Romanesque architecture at the Basilica di San Zeno Maggiore, a stone basilica that was constructed in honor of Verona’s patron saint. A lovely cloister greets all visitors to the basilica which is also home to breathtaking frescoes. To enjoy a picturesque view of the city and to enjoy the landscape of the mountains in the background, climb to the top of the 84-meter watchtower of the Torre dei Lamberti. Next read: 21 Best Things to Do in Bolzano, 50 Most Beautiful Places to Visit in Slovenia. Enjoy the medieval atmosphere and intriguing attractions of Bologna, an elegant yet gritty city in the beautiful country of Italy. There are a handful of enjoyable religious sites in Bologna to explore. Start your journey at the Abbazia di Santo Stefano, a labyrinth of ecclesiastical buildings that combine Lombard, Romaneque, and ancient Roman architectural elements. 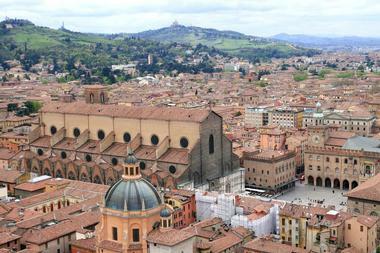 Bologna is also the home of the 15th largest church in the world, the Basilica di San Petronio. Interestingly, the basilica, which was established in 1390, was never completed. Enjoy a stunning example of religious architecture and take in a lovely view of the city as well at the Basilica Santuario della Maddona di San Luca, which sits on the top of a hill in the heart of the city. Learn about the interesting history of Bologna at the Museo della Storia di Bologna where interactive exhibits contain the perfect mix of educational text and beautiful works of art. Make sure to watch the 3D film and to see a recreated Roman canal. For a truly immersive experience of Bologna’s art, head to the Pinacoteca Nazionale, which features an inspiring collection of paintings from the 14th century created by Bolognese artists. Don’t miss out on the Palazzo dell’Archiginnasio and its beautifully preserved anatomical theater where 17th century surgeons used to study. 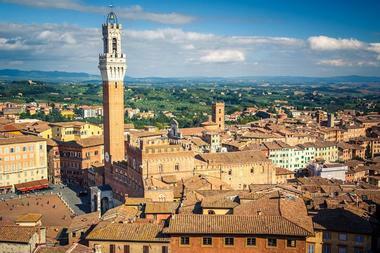 Sometimes referred to as a medieval masterpiece, Siena is, without a doubt, one of the most stunning cities to visit in Italy. On the top of list of places to see is the Siena Cathedral, a breathtakingly beautiful Italian church. Not only is the architecture of the church completely stunning, it is has also seen contributions from some of Italy’s greatest artists like Michelangelo, Giovanni Pisano, and Donatello. When it comes to Siena’s architecture, another must-see is the Complesso Museale Santa Maria della Scala. This 13th century hospital is marvelous to walk through and admire the gorgeous frescoes from the 15th century that line the building’s walls. For avid museum goers, stop by the Museo dell’Opera del Duomo where artworks that were previously housed at the Siena Cathedral are now stored and displayed. One of the feature exhibits at this museum are 12 statues by Giovanni Pisano that depict philosophers and prophets. Admire a lovely collection of Gothic pieces by master artists like Ambrogio, Simone Martini, and more. Make absolutely sure to stop by the most famous museum in the city, the Museu Civico. At this museum, visitors can enjoy a break from the religious frescoes that seem to dominate Italian artistry and view secular works instead. Perhaps the most famous work the Museo Civico has is the Maestà by Simone Martini. While it’s true that Naples has had a long history of unsavory characters since the 17th century, it is also true that this city has its own charm and hidden gems just waiting to be discovered. Historically, Naples was the second to the largest city in Europe just a few centuries ago and certainly enjoyed the grandiosity that came with a city of such stature. Perhaps one of the most well-known sites in the city is the Cathedral in Naples, which has in its possession the holy dried blood of St. Gennaro. It’s said that the blood mysteriously liquefies thrice in a year, and the city watches the event ceremoniously. Travelers should also visit the 3rd century catacombs of San Gannaro, which are located within a stone’s throw of the cathedral. Neapolitan tradition is best experienced at the San Lorenzo Maggiore, a Gothic church, and its adjoining street lined with vendors of various goods. Of course, the center of Naples is rich with history all on its own and is considered a UNESCO heritage site thanks to the many palaces, ancient churches, and narrow streets. The center even has underground passages that can be discovered. 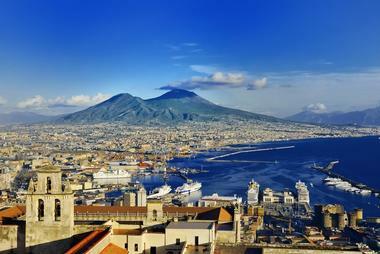 There’s also some fantastic shopping to be enjoyed in Naples, especially along the popular street of Via Toledo.